Rae Cassidy Klagstad, the angel-voiced singer-songwriter who recently relocated from Milauwakee to NYC, just keeps improving. 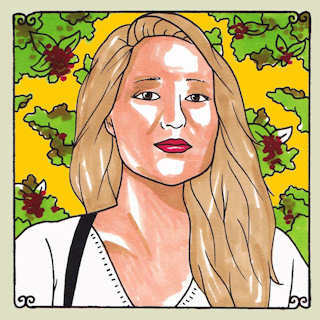 First with her home-recorded EP from earlier this year, Dreamt Beneath The Cassidy Tree, then with the first single from her upcoming, debut album Cave Ghosts, and now with this beautiful Daytrotter session, she has continued to show her growth as an artist. In this live session, the improvement in Rae's guitar playing and already splendid voice is immediately noticeable. The new songs from Cave Ghosts are more raw, emotional and mature than any of her previous works and they find her really showing off her pipes. She performs the new songs so well and the recording is so good that these could easily be cuts from the actual album. The new songs are quite dark in tone, and the emotion on display is heart-wrenching at times. Rae seems to capture and hold for eternity the painful, hopelessly romantic longing that follows her first heartbreak, the moment when she realized that loving someone with all she had wasn't enough to sustain the relationship. Obviously, this isn't the ideal thing to listen to if you're getting over a bad break-up or are in the mood for something uplifting, but it's definitely still worth a critical listen. Rae is really coming into her own as an artist and performer. Her voice and guitar work together to create something so beautiful it's hard to believe your hearing it at times. Seriously, her singing is that good and this is the best I've ever heard it. Definitely give this a listen and don't be daunted by the task of signing up for Daytrotter if you are a new user. This and many of the other recordings on the site are very much worth it. The link for the session is below along with a video of Rae performing "Come Back" live in a silo (yep).